Indeed, Andaman is one of the perfect places to hang out with friends and close ones. The swaying palm trees, turquoise sea, sun-kissed beaches are just some great experience to rejoice in Andaman. Apart from the beauty of nature, Andaman is filled with luxurious resorts and hotels. Well, if you want to make your Andaman journey memorable, then you need to ensure a stay in the best resort. But again, the expenses in accommodating a stay in the resorts can be pretty hectic. To reduce the worries and stress regarding budget, below here top 5 budget hotels in Andaman are described briefly. If you are looking for a comfortable hotel within an affordable budget, then Hotel Shreesh is perfect for you. This beautiful hotel is situated in PortBlair. Both travelers and corporate clients greatly appreciate the accommodation at Hotel Shreesh. As it is located in the center location, you can flexibly plan your outings in Andaman. Apart from offering accommodation at an affordable budget, the hotel also serves delicious foods at the best price. Thus, Hotel Shreesh assures you the best combination of budget stay and food in Andaman. The tariff plans start from Rs 1,800 and onwards. If you have a fantasy to stay in cottages, then you can make that true with Cross Bill Beach resort. Here, both AC and Non AC cottages are offered at affordable price. The tariff starts from Rs 1500 and goes up to Rs 4000 as per the choice of room. This resort is very popular for serving delicious seafood, so don’t forget to try them. Apart from that, the resort also arranges snorkeling and scuba diving tours on prior request of the travelers. Perhaps, this is the best resort in Andaman which offers you accommodation within your budget. The price starts at Rs 1200. Thus you can ensure a stay as per your convenience. Tango Beach Resort is located on Neil Islands with maximum facilities and amenities. The restaurant serves you exotic dishes so that you can remember the taste of Andaman. You can enjoy scuba diving, fishing, jungle trekking, snorkeling, swimming, and other adventurous activities at the resort. This resort is designed in authentic Andamanese style. The thatched roofs and the spacious cottages beneath the Jade green hills of Havelock will rejoice your mood. The Red snapper restaurant and Emerald Gecko bar in the resort are the favorite hangout destinations for tourists. The tariff plan starts from Rs 3000 and goes onwards. If you are looking for a classy resort at a reasonable budget, then Blue Bird ensures you the best services. This lovely resort is decorated with traditional designing and spacious cottages. You can enjoy the delicious foods at the multi-cuisine restaurant inside the resort. Again, the Radhanagar Beach is just some few steps away from the resort. When you are planning to avail Andaman Tourism packages, make sure you manage the accommodation in one of the above resorts. Well, there are some scenic destinations to witness in Ladakh. Indeed, you can term it as a land of paradise. Every traveler who has visited Leh & Ladakh, have just fallen in love with those high snowy mountains and exotic climate. If you are planning to visit Ladakh shortly, then it is highly recommended to visit the below five destinations without any miss. This is the main tourist attraction of Leh- Ladakh tour. Pangong Lake is the highest Brackish Lake in the world, which is situated at 14, 256 ft above the sea level. The road to Pangong Lake is very typical, so it may take more time to reach the Pangong Lake. But once you reach the Lake, the scenic view is mesmerizing. The blue color water and the brown colored mountains will make your day for sure. It is suggested to spend some time on the Bank of Pangong Lake to rejoice the soul. If you are lucky, then you can cite the rare species of Black Necked Siberian Bird. This famous hill will fall on the road towards Leh. It is also known as Gravity hill, as the magnetic force in this particular area is very high. According to the experience of travelers, the magnetic force automatically pulls the vehicles uphill. Well, when you are in the land of Paradise, it is obvious to experience such magical things. The Border Roads Organizations have signaled the area with big boxes so that the tourists can enjoy the magnetic force in real. You can term it as a desert among those high Snowy Mountains. 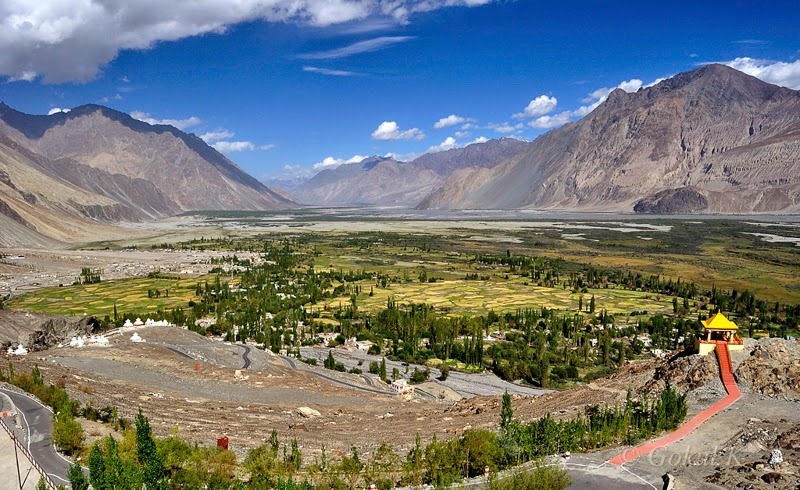 Yes, Nubra Valley will give you the feelings of Arabian nights with its dunes. Nubra Valley ensures you great pictures of nature, as it has got the view of Indus valley in south and Siachen Glaciers in the North. This valley is also termed as “the valley of Flowers,” as some beautiful and vibrant flowers grow in this region. The best time to visit Nubra Valley is during the autumn season. 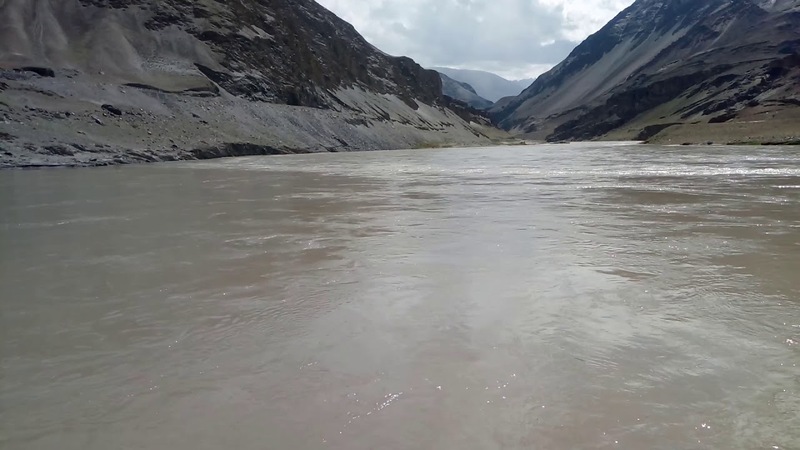 This is the point where the Zanskar and Indus River have met, thus it is termed as the point of Sangam. After meeting, the river flows towards Pakistan. Thus it is one of the mesmerizing scenes in those high mountain passes. As Zanskar is always frozen and the Indus River is warm, the meeting point seems very fascinating. Again, the atmosphere at Sangam point is very soothing. So, when you are availing a Leh tour package, make sure these above destinations are included in the package. If you had ever wondered, Rajasthan is only the place rich in its royal culture, magnificent mountains, palpable cuisines and ethnic attires, than this aspect of region, would force you to break onset traditional image of the historical place. The region holds numerous haunted places which could give you nightmare at a glance. In this article we will show you glimpse of such locations, and tell you about the stories may or may not be true, which you could encounter while you visit to Rajasthan. A small ghost town, situated in Rajasthan is one of the most haunted places in India according to ASI. It has all the ingredients of a classic horror tale. As per the folklore, long time ago in around 1800s, it was home of a community, who overnight left the village deserted and cursed it, to eventually stop a minister from forcibly marrying a beautiful girl of the village. After that the place never witnessed any inhabitant and turned into ruins. The village was later checked by paranormal society and found some evidence of ghost and spirits here. Often said to be the most haunted place in India. The fort was built on a hillside by King Madho Singh. It is believed that once a wizard fell in love with the princess Ratnavati and conspired to trap and marry her. Soon princess got to know the reality which resulted in the death of the wizard. Before dying, he cursed the village following which it soon deserted. The Brij bhavan is located in Kota is now a heritage hotel which is said to be haunted by a British major. During the mutiny of 1857, Indian Sepoy killed Major Charles and his family, who was the employee of East India Company. It is believed that the harmless spirit is still present in the place. This is a weird residential place in Rajasthan. The stories float on the streets that once there was a king who was very greedy and inefficient. Many villagers died to starvation here and cursed the place. It is believed that people could see witches roaming in the night, who ask help from the tourist. These witches look the same as shown in Bollywood films with white dress, open hairs. It is famed as the ‘road that asks blood’. The portion of road situated on NH-79 near Dudu village. It is believed that many years ago when child marriage was prevalent in India, a 5-year girl was forced to marry a 3-year boy. The mother of the girl was reluctant to marriage and she ran away towards highway to seek help. Apparently, she was struck by a tourist vehicle that killed her and her child. These are the few haunted places which you could visit in your Rajasthan tour packages. The spooky stories related to every place, may or may not be true, but it is surely an anecdote. Who says Hyderabad is all about Charminar or Mecca Masjid? There is a lot more to do and visit in Hyderabad, the City of Nizams. So, this time visit Hyderabad for some of the amazing places dotted here, apart from the two popular mosques of the city. Mumbai to Hyderabad by flight is a common pick of a tourist and everyday there are flights to and from these cities. Even flights from the capital city, Delhi are quite ubiquitous. Choose the mode which best suits your travel journey and make haste this vacation, to unravel the charm of the beautiful city of Hyderabad. It will take you aback. Here are the places you should visit in Hyderabad, to make your memories as fresh as ever. Shilparamam: The market is a must visit for all kinds of souls. A day trotting in this market will let you bask in the greatest of the joys and happiness. Family or friends, with whoever you visit it, it is bound to bring you brimming entertainment. Shopping in this market is the first thing one comes for, here. A plethora of traditional items like paper mache of Kashmir, Rajasthan’s Bandhani work, brassware of Moradabad and what not, you can experience here, a touch of every state. There are henna tattoo makers, portrait skechers, music and dance performers, and craftsmen, to present you with a number of options to elate your hearts with. You can even ride a bullock cart all by yourself, far from the traffic of the roads. Also get the name of your beloved, written on a grain of rice, and bring it back home as a souvenir. Hussain Sagar Lake: An epitome of serenity, this lake is a must visit, especially in the twilight hours, when it jazzes up with enchanting lights. You can pacify your hearts boating here, and view the famous Buddha Statue, erected in the center of the lake. A number of restaurants are nestled along the fringe of the lake, which serve the best dishes to savour upon. Nehru Zoological Park: This park is a paradise for nature lovers and solace seekers. Sprawling on a vast land of 300 acres, it houses an immense variety of flora and fauna. If you are a shutterbug, then it ought to pep your interest. Wander around in the park, amidst the thicket of nature and soak in tranquility and joy. The major attractions of the park are the Lion Safari Park, National History Museum and the Children’s Train. The park remains closed on Monday, so plan your itinerary accordingly. Lamakaan: Falling under the most happening list of places to visit in Hyderabad, Lamakaan is an open cultural space in Hyderabad, where the greatest of the intellects and artists come up and brainstorm their ideas on important issues. This open area drowned in the evergreen forests, is open to all. One can conduct their startup meetings and other important discussions. There are facilities of hot tea and water. The place also conducts various exhibitions and other events; so a very lively place to visit and chill yourself. If not this, grab your favourite book and read here. Mysore, the “cultural capital of Karnataka” and the second biggest city in the state, is an acclaimed holiday destination in South India known for its lavish and imperial vibe. The old world appeal of the city alongside its all around well-developed gardens, legacy palaces, and shady parkways leaves an everlasting memory in the souls of the tourists. According to the Union Urban Development Authority they conducted a study in the year 2010, and Mysore was proclaimed the “second cleanest city” in India and first in Karnataka. Tourists visiting Mysore in general have their tour itinerary related to the city only. While on an exploration of Mysore tourism, their tour plan usually includes a visit to the most prominent tourist attractions, cultural centres, eating at the finest local restaurants, etc. What the majority of the visitors miss in their Mysore visit is the towns and villages, where dwells the genuine essence of Mysore. So this vacation on your trip to Mysore, leave the general traveler bubble, attempt the off beaten way and checkout these villages in Mysore district, your outing will be absolutely fun as well as a new experience. Halli Mysore is a village falling in Holenarsipur Taluk in the Hassan District of Karnataka State, India. It has a place with Mysore Division. It is situated about 48 KM towards South from the district headquarters of Hassan, 16 KM from Holenarsipur and about 174 KM from State capital Bangalore. Additionally, the village is encompassed by Arkalgud Taluk towards west, on north is Channarayapatna Taluk, towards east is Krishnarajpet Taluk, and towards south is Krishnarajanagara Taluk. Additionally Hassan, Sakleshpur, and Shrirangapattana are the close-by cities to Halli apart from Mysore. Tagadur is a village falling in Nanjangud Taluk in the Mysore District of Karnataka State. It has a place with Mysore Division. The village is situated about 35 KM towards South from District head quarters, 16 KM from Nanjangud, and about 151 KM from Bangalore. Kavalande Rail Way Station and Badanahalu Rail Way Station are the nearest railway stations to the village. However Mysore Junction Railway Station is major railway station, 34 KM away from Tagadur, with more number of trains to serve it. Belavadi is a little town/village in Mysore Taluk in the Mysore District of Karnataka. It goes under Belavadi Panchayath. It has a place with Mysore Division. It is quite close to the city; to be precise, 1 KM towards South from District head quarters of Mysore. Additionally, it is 148 KM from Bangalore. Mysore Jn Rail Way Station and Chamarajapuram Rail Way Station are the nearest railway stations. A basic life that is by all accounts negligibly touched by modernity, lovely local people who are glad to welcome the visitors and offer an authentic hospitality, and their hundreds of years old traditions and culture, all contribute to making these villages just irresistible. Life is entirely moderate in these towns and immaculate to unwind and revive. Tag along with the locals and be a part of their discussion, even though you know nothing about what they are discussing, but try to listen. This is a great way to understand the culture of any place. Although not counted amongst the most popular places to visit in Mysore, they are certainly worth visiting. They are the offbeat attractions that present tourists with a different aspect of Mysore. Small, yet charismatic; located in a corner, yet referred as one of the travel hubs of the country, Sikkim is one of the most beautiful and pleasant states in India. Located in the North-Eastern corner of the country, the true grace and charm of this magical destination can hardly be expressed in words; one should visit Sikkim and witness its enchanting beauty! Cradled in the lap of the mighty Himalayas, Sikkim boasts of being a tourism hub of the country. Whether you are planning a family trip, looking out for some fun with friends, yearning for your honeymoon or simply yearning for a solo trip, this is the place for you! Also, whether you seek for pleasant moments, thrill and adventure or wish to delve deep into culture and traditions, Sikkim tourism will offer you thousands of reasons to fall in love with the state. For the leisure seeker in you, Sikkim tourism offers a wide range of choices! You can either opt for the scenic places to visit or indulge into some of the wonderful and pleasant things to do while in this gorgeous state. Among the many different places to visit, most of the Sikkim tour packages include Gangtok which is the capital of the state and is also known for its pictorial beauty, Yuksom which is also known as the ‘Meeting Place of Three Lamas’, Nathula Pass that is one of the highest motorable pass in the entire world, Pellingthat offers the most astounding views of the Kanchenjunga Peak, Tsomgo Lake which is one of the important names in Sikkim tourism, Ravangla and Lachung that are known for their scenic beauty. If you are among the thrill and adventure seekers, the various Sikkim tour packages will also keep you enchanted with their breath taking offerings. Jotted with numerous hills and lofty peaks, trekking is indeed an integral Sikkim tourism; whether you are a beginner or an expert trekker, trekking in Sikkim will always keep you immersed in unlimited fun and excitement. River rafting is also one of the enthralling offerings of the various Sikkim tour packages. Most of the rafting expeditions are conducted in the gurgling Teesta and Rangit rivers. You can also participate in paragliding in Chakung and enjoy the aerial beauty of Sikkim and its evergreen outlook! And for the biker in you, Sikkim tourism offers mountain biking options to places like Rumtek, Tema, Sirwani, Melli and others. Does not matter what the season is; the reason or occasion also does not matter a lot when it comes to visiting the paradise called Jammu and Kashmir. Whether you want to escape the scorching heat of the summer or treat yourself in the best possible ways by embracing the chilling winters, Kashmir, with all its charm and grace will keep you enchanted for sure! Located at a height of 5,753 metres above the sea level, this jewel in India’s crown is in fact one of the most sought after destinations in the entire world. Cossetted by the mighty Himalayas and separated from the rest of the country by the PirPanjal Range, it shares national borders with Himachal Pradesh and Punjab. Thus, it also makes an important tourist destination from any part of the country. When it comes to Jammu and Kashmir tourism, one can find ample of options that will add pleasant and memorable moment in their tour itinerary. Starting from the scenic beauty to natural marvels, enthralling options to cultural sights, Jammu and Kashmir tour packages offers plenitude of options to know more about the enchanting beauty and the roots of the region. Mainly divided into valleys like Tawi, Kashmir, Chenab, Lidder, Poonch, Sind and others, the entire of the state showcases the best and untouched form of Mother Nature. Adding more to the opulent and evergreen beauty of these valleys, there are also the fascinating Zanskar Valley, Leh, Ladakh and several other places that plays important attraction points for Jammu and Kashmir tourism. When it comes to visiting this heaven on earth or even planning a trip, one need not to worry much and avail any of the Jammu and Kashmir tour packages. Most of these packages include visiting and sightseeing across all the major tourist spots, participate in the most popular activities around the region and other tourism options. Also, the opulent and gorgeousness of Jammu and Kashmir makes it a favourite destination for all the types of travellers; be it the family members, corporate groups or friends travelling together. While for the nature lovers, it is not less than a treasure trove, the leisure seekers can find ample of opportunities to laze around its bucolic beauty. Jammu and Kashmir tourism also offers several enthralling options to the thrill and fun seekers; games and activities like heli-skiing, river rafting, trekking, mountaineering, biking expeditions and other similar are popular amidst the craggy terrains, towering mountains and the tricky passes of Jammu and Kashmir.